Sea turtles can be found in oceans in every corner of the world. They’re born small enough to fit into the palm of your hand, with a wanderlust that drives them straight into the ocean, never to come out again in some cases! Think you know everything there is to know about sea turtles already? Here are 5 fun facts you may not have known before! Male sea turtles never return to land after birth, but female sea turtles will find a nice sandy beach to dig a nest and lay her clutch of eggs. Each season, she may lay 65 – 180 eggs every two weeks during a nesting season. 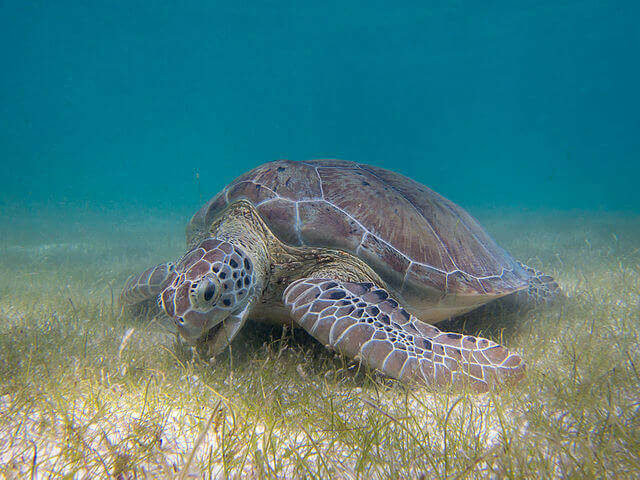 The eggs will incubate for 50 – 60 days, and when the turtles are ready to hatch, instinct leads them into the water! The gender of the hatchlings has everything to do with temperature during incubation – cooler temperatures produce male turtles, and warmer temperatures mean the hatchlings will be female. Sea turtles are on the move their entire lives, and will travel thousands of miles in a lifetime. A female turtle was once observed travelling over 12,000 miles from Indonesia to the U.S.! Incredibly, even though they travel such long distances, many females will return to the beaches where they hatched to lay their own eggs. There’s no place like home! The first sea turtles are thought to have roamed the oceans over 100 million years ago. They shared the planet with dinosaurs and watched the world change around them – but they haven’t changed much at all! The oldest fossil ever was found only two years ago in Columbia. 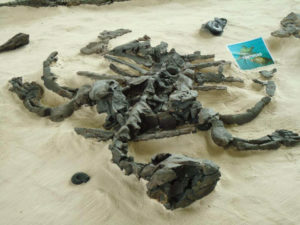 You don’t need to be a paleontologist to see that it’s a sea turtle! The lifespan of sea turtles is hard to pin down, but most observers agree that they live to be between 80 – 100 years old in the wild. An aquarium in China has a turtle in captivity that they claim is over 400 years old, but it doesn’t seem to have been verified. There are seven different species of sea turtle in existence today – with three listed as vulnerable, one as endangered, and two as critically endangered on the IUCN Red List. The ocean is a vast, dangerous place, but their biggest threat is still humans. 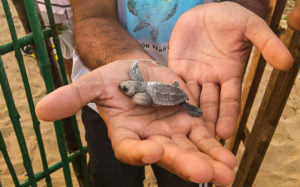 You can learn more about sea turtle conservation, what you can do to help, and adopt a sea turtle at worldwildlifefund.com.